We know that this episode is different from others when the opening narration is “My name is Damien Darhk….” which recounts what happened to Darhk and how he came to join forces with Eobard Thawne. Meanwhile, our Legends are debating on how to get Rip back. There is discussion on giving back the medallion but the team wants to figure out how to use it before hand. Martin says he knows a colleague that can help back in Central City. The rest of the team works on trying to ID the speedster. Nate, Amaya and Sara go through a list of all the speedsters they know (we see photos of Kid Flash, Trajector, the Flash, Reverse-Flash and I not sure if we see Jesse Quick) and when Sara realizes the speedster wants the spear to fix something in his reality. At Jitters, Jax is surprised that Lily is the colleague but she figures out how to open up the medallion. To open it in a more private spot, Martin brings her onboard the Waverider. Merlyn says can hypnotize Rip to get his memories but it doesn’t work; Rip’s memories aren’t locked away but simply gone. Throughout the episode the Legion of Doom keep on referring to Rip as a pudding-brain hippie. 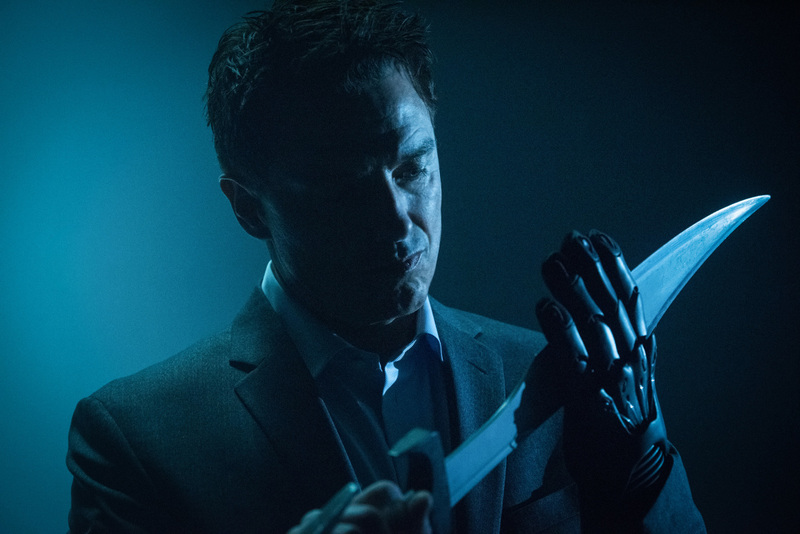 Next up is Darhk who takes out Rip’s tooth and sees that it contains a chip to open up a Swiss Safety deposit box which was last accessed in 2025. The Legion of Doom believe the rest of the Spear of Destiny is in there. So Merlyn and Darhk take Rip there but he is unable to open the vault as he doesn’t remember his access code. Everything goes south from there forcing Rip, Merlyn and Darhk to flee. Meanwhile, the team isn’t happy that Martin brought Lily on the Waverider but relent when she can figure out how to use the medallion by plugging it into Gideon. Ray volunteers to help. Martin warns the Legends not to tell Lily she is a time aberration. However, after successfully connecting Gideon to the medallion, when Ray and Lily celebrate, Rory lets slip she is a time aberration. When Lily learns what her being a time aberration means, Martin’s behaviour towards her becomes clear and she becomes very upset. Jax advises Martin to tell Lily that he loves her. Martin shares with Jax the reason why he and Clarissa didn’t have kids in first place and that was fear that he was going to be like his father. Martin apologizes to Lily and admits that while initially he didn’t want children, his time on the Waverider has made him realize that he needs his daughter. Father-daughter reconcile and Lily goes back to 2017. The Legends get a break through on who the speedster is when Martin realizes it is Eobard Thawne and how he was erased from existence because his ancestor Eddie Thawne killed himself, which is why the Time Masters have no files on him. Nate figures out why Thawne needs Merlyn and Darhk and that is because he can’t stay in one place for long as he needs to be one step ahead before his non-existence becomes a reality. Merlyn and Darhk returns to 2025 and breaks into the vault and opens Rip’s box. Thawne arrives and says the tech is something that has Rip’s memories. Darhk and Merlyn trap Thawne in the vault as time starts to run out for the speedster. Thawne admits that he needs the two as much as they need him. Thawne tells them that he is being chased by the Black Flash and is attracted by his Speed Force. After getting Thawne to admit that they are all in a partnership, Merlyn and Darhk help Thawne evade the Black Flash by not using the Speed Force. The Legion of Doom returns to 1967 LA and alter a bit of Rip’s memories before uploading it back to him. We then go to Christmas Day 1776 and see Rip go into General Washington’s tent and shoots him. As much fun it was to have Arthur Darvill adopt a nebbish American accent it is great to get his British accent back. Hopefully, the Legends can bring our Rip back and not the Legion of Doom Rip.